Travel with Kevin and Ruth! : What a great afternoon! First, a little background. Garry runs ATV (all terrain vehicle) quad tours up in the mountains. 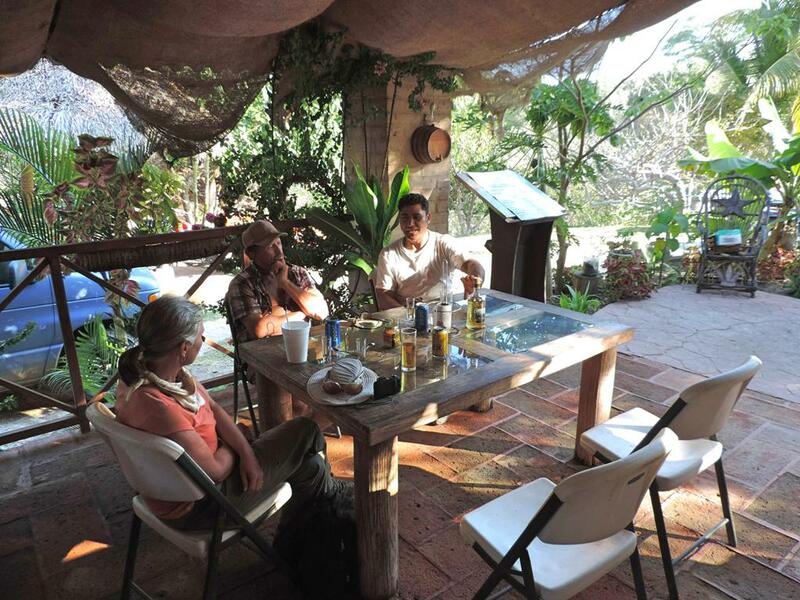 It's a neat little business they have going, where they take up to eight or ten tourists on ATV's on some trails through the jungle up to a private tequila ranch and event salon. The tourists have fun on the quad bikes, then they enjoy an hour or two at the ranch and have some drinks and maybe some food, and then return on the trails. So Garry wanted to check out the possibility of making a trail up an old access road to the top of a hill where an old cell tower used to be. That involved us hopping on the ATV's just to get there! It was about 1:30pm when we took off. We didn't get very far when I noticed that one of Garry's tires was going flat and we made a little detour to a repair shop. Didn't take long, and we were on our way. To get to the trail he wanted to explore, we had to go to the tequila ranch first and pick up Juan, the guy who owns the property. Ruth and I heading up to the ranch. It's a pretty spot, in the middle of nowhere. And with puppies! There were three little ones. And then we headed off to search out this old road. We did find it, and we went as far as we could with the quad bikes, but eventually we left them and set off on foot. The road was built about 14 years ago to put up a cell tower, and then the deal apparently never came together and the project was just abandoned. So the road is eroded in some spots, and overgrown in others. But it wouldn't take much work to make it accessible with the quad bikes and then they would be able to bring people to the top of the mountain for the view. Kevin, coming through the forest on his ATV. Gary and Juan doing some clearing. Starting to get a view. What's left of the old tower at the top. It was 5:00pm by the time we reached the top! Fortunately, it was a quicker (but much steeper) route back down, but it was still after 6:00pm by the time we made it back to the tequila ranch. Then of course, Juan insisted we have a cold drink and of course the talk made it round to tequila, and he insisted we try the various versions! Socializing back at the tequila ranch. 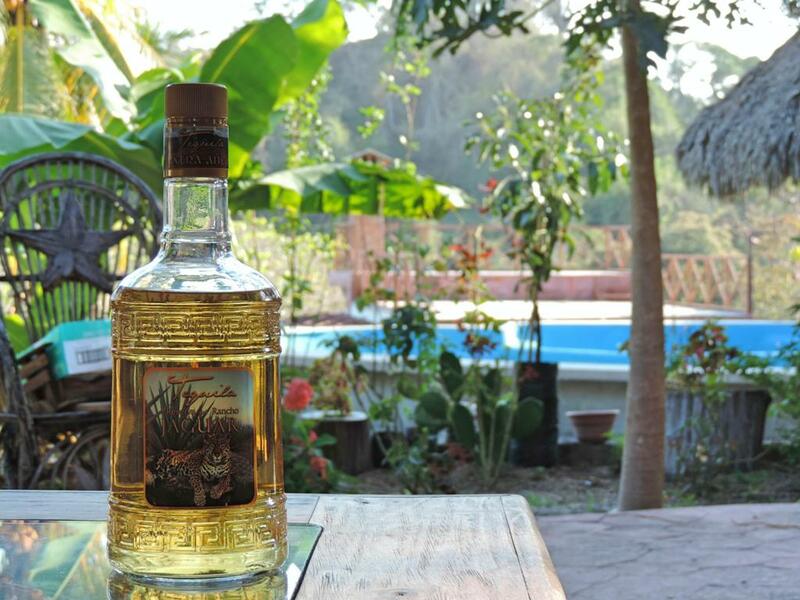 The tequila isn't actually produced here, and it's not for public sale so you won't find it on store shelves. But he does sell it to friends and some of the tourists who visit here. It is good tequila! They have a pet coatimundi at the ranch. It's part of the raccoon family. What a great afternoon. Didn't make it back to Sherman until 8:00pm! We were exhausted! 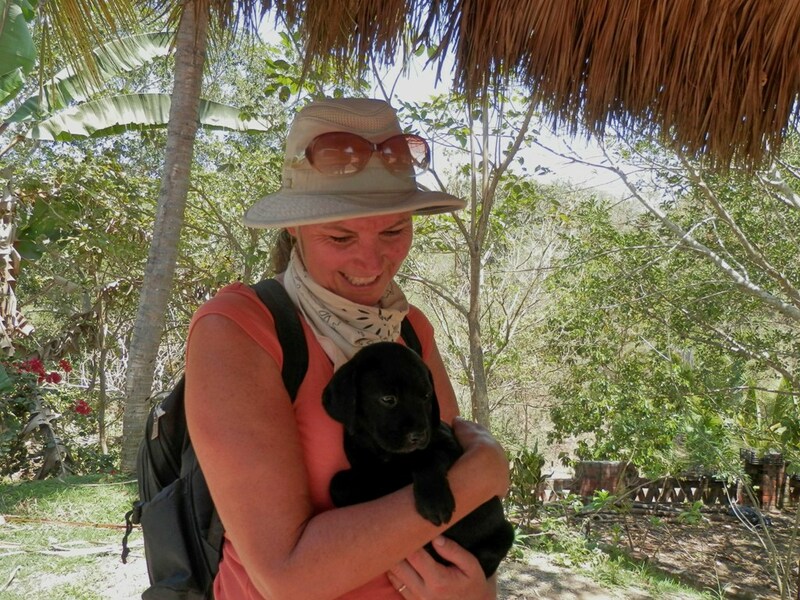 Another great adventure, topped off with the cutest puppy EVER! We had such a great afternoon and I sure loved holding the puppies! That sure is a cute puppy, how adorable. Looks like it was a great day. We was such a sweetie! It does look like she might have a bit of lab in her but see won't be a real big dog. The view was very pretty but it could have been better if it wasn't so hazy. Oh man. Puppies can be dangerous, especially if you pick them up. That's the precise moment when you want to take it back home. Just have to step away. It was nice to hold her and cuddle with her but I didn't have a problem putting her back with her momma and walking away! It must have been hard on Ruth to give this cute puppy back. I really didn't have a problem with it. I know that we aren't ready for another dog at the moment. I see a puppy in Ruth's future. You will just need to find a sitter when you take your world trips. ..... Like a grandson? Nope, no puppy in my future! I think it will be a while before we get a dog again. I am happy making a fuss of all the puppies and dogs we see along the way though! The pup looks like our lab Annie.. Guess that means that Annie has the cutest face! Another fun day, did Ruth bring a puppy home??? No the puppy didn't come home with us! Looking at your header picture, you'd be a fool to not want to be there! That looks like paradise. Too bad they didn't have an RV park there, the nights would have been so quite. Mind you the road in would be a bit tough to navigate with a motorhome. Yep, we love going into the mountains with Garry on them. He really knows the area well. Adorable puppy, but you are smart. We have a small dog we adore, but she does make our traveling lifestyle a lot more challenging! That said, we have managed to find more and more pet-friendly accommodations lately -- we don't have an RV but mainly stay in VRBO and Airbnb lodgings in our longer-term destinations, along with some budget/moderate hotels along the way from place to place. Still, it's much easier to travel without pets.